First, remove any feathers still remaining on the poussin, rinse it and dry it well. Next, open it at the back, removing the spine. Blend the rest of the ingredients and smear over the poussin with your hands so that all the marinade spreads over the meat. To finish, place everything in a 99% vacuum bag and cook it in the SmartVide for one hour at 72ºC (161,6ºF). First prick the kumquats a little so that the syrup penetrates. Next, place them in a bag with the raisins and the syrup. Vacuum pack the bag to 99% and cook it in the Smartvide for 50 minutes at 72ºC (161,6ºF). When the chicken is ready, open the bag, strain the juice and reserve it. 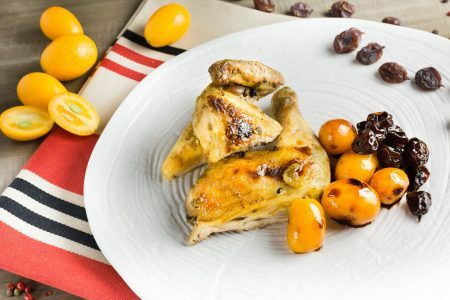 Place the poussin on a tray and place it under the grill to brown the skin, slowly drenching it with the juice reserved from cooking. Meanwhile, open the kumquat bag and strain it. Place all the ingredients into a pan to caramelise and brown together. When it is golden, add the red wine and leave to reduce. To finish, add salt to taste and serve. This recipe enhances maceration and cooking at the same time. Therefore, when the chicken is in the marinade, the juices penetrate quickly into the meat, so the chicken is always juicy. Note: the chicken can be left to macerate for longer if desired, leaving it ready to cook. It can also be stored after cooking and left alone to regenerate.